The Castle McCulloch Gold Mill is a restored gold refinery in Jamestown listed on the National Register of Historic Places. Built by Charles McCulloch, a Cornish engineer who brought the new steam engine technology to North Carolina from England, the structure was completed in 1823 and restored in the early 1980s. It is a granite castle, complete with drawbridge, moat, and 70-foot tower. Using locally quarried granite, McCulloch and stonemason Elizier Kersey created a Cornish Rock Engine House for the refining of gold ore, with a "Walking Beam" steam engine that powered Chilean mill ore crushers. After years of ownership within the McCulloch family, the site passed through several hands and fell into disrepair before being bought and rebuilt by Richard Harris during the mid-1980s. It is maintained by the McCulloch Foundation. The site is popular for such occasions as weddings, receptions, and corporate events. In 1997 the Crystal Garden was built nearby, with Victorian-style beveled glass walls, a crystal chandelier, and a veranda with a view across a lake to the castle. The gold mill-which operated on the grounds of the castle for its first three decades-offers gem and gold panning, historical tours, and rock quarry visits. 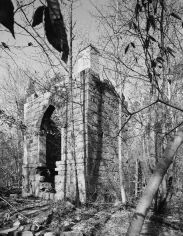 Elizabeth Hines, "McCulloch's Rock Engine House: An Antebellum Cornish-style Gold Ore Mill near Jamestown, North Carolina," Material Culture 27 (1995). Grimsley T. Hobbs, Exploring the Old Mills of North Carolina (1985). Alexander R. Stoesen, Guilford County: A Brief History (1993). McCulloch Gold Mill, Copper Branch, Jamestown, NC. Image courtesy of Library of Congress. Available from http://www.loc.gov/pictures/resource/hhh.nc0043.photos.102214p/ (accessed October 3, 2012). I played in the castle also as a kid. Ty for the pics and info! Thank you 4 the history on such a unique piece of NC HISTORY...my home from birth, 51 Yrs and VERY PROUD!